We're often asked, what's the best part of our jobs. While it's hard to pick from so many rewarding aspects of owning the bakery and meeting so many friends, we'd have to say the most favorite thing is watching someone taste our famous CORSICA LOAF™ for the first time. There's nothing like seeing the expression on their faces as they enjoy the wonderful goodness of our custom french bread infused with olive oil. We use a special stone-oven high-temperature baking process of DCB French dough within a bath of our custom blend of olive oils and sesame seeds. The original CORSICA LOAF™ and subsequent collective brand has truly become synonymous with name Door County Bakery, and is most assuredly the "flagship" of our establishment. Now is the perfect time to enjoy your first slice. We're ready for you. Enjoy breakfast or lunch with us. Named after the island of Corsica, this culinary classic was created by the Door County Bakery. An evolution of our European-style Stone Oven Breads™, CORSICA LOAF™ is a marriage of French bread dough with a stone-oven baking process which incorporates our own blend of olive oils and sesame seeds. In 1969, Don was in school in Strasbourg, France, where he initially became fond of and fascinated with real French bread, the baguette. He Learned that generally, throughout Europe, the professional bread-baker sees to it that the yeast in the bread dough is given a fermentation time of at least 18-20 hours before beginning the bake. In effect, this greatly helps to break down the gluten fibers in the flour, and to develop enhanced robust flavor in the finished bread. Here in the States, we often tend to produce bread with no more than a 1-to-3 hours fermentation of the dough, and as a result, we frequently struggle with gluten-related health issues, and accept compromised quality in bread flavors, as well. At The Door County Bakery, LLC, one of our cornerstone principals has always been to fully engage to the best of our ability the traditions of European scratch-baking. In 2001, based on the foundation of our own well-fermented French dough, came the development of our now nationally known and trademarked CORSICA LOAF™ . 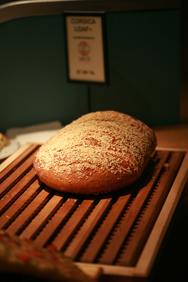 We actually infuse the bread with olive oil, creating a "to die for" taste and a texture that's light but firm. You'll want to keep a napkin handy! This is a truly unique loaf with exceptional texture and "one bite leads to another" flavor. It's an evolution that's become a revolution! Yes, we're constantly asked, "How do you do it?" No, we're not saying. CORSICA LOAF™ - The original product is formed as a 6 lb. loaf and sold at the bakery in any desired amount by the pound. Often times, customers will choose to purchase an entire loaf, as it may be sectioned, wrapped and frozen quite successfully for future thawing and reheating. ​CORSICA STIX™ - We “docker down” the Corsica Loaf™ before it goes into the Stone Oven, then slice it up with Samurai Swords and roast the golden morsels! Learn more here. CORSICA BUN™ - This member of the CORSICA brand is produced sans sesame seed, but otherwise also the same recipe as the original CORSICA LOAF™. We produce the CORSICA BUN™ as approximately a 3/4 lb. loaf.